So, after the last timeline of 2017, it’s time the publish the last round of statistics derived from the December timelines. Technically these won’t be the last statistics of 2017 though, as I am preparing a summary for all the data collected in 2017. Anyway, let’s start, as always, with the Daily Trend of Attacks chart that shows a decreasing trend throughout the month. It’s also interesting to notice that no events were recorded around Christmas, did the crooks really decide to take a few days of vacation? Or is this simply a side effect depending upon the fact that many of the sources that I normally consult to prepare the timelines and the statistics took a break during Christmas? 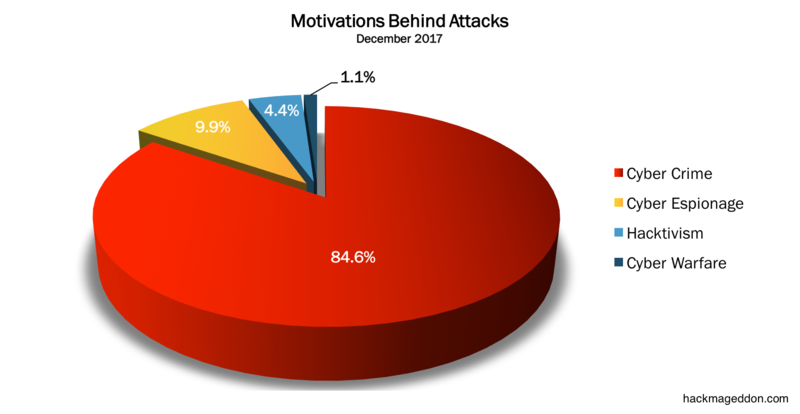 And, easily predictable, Cyber Crime closes the year on top of the Motivations Behind Attacks chart with 84.6% (it was 76.2% in November). Cyber Espionage drops to 9.9% from 13.1%, whilst Hacktivism falls back to the normal low values that characterized 2017, (4.4% from 9.5% of November). Cyber Warfare is in line with the values of the last months with a tiny 1.1%. The Attack Vectors confirms malware on top with a 36.3% that essentially in line with November when it was 35.7%, ahead of accounts hijackings (18.7% vs 13.1% in November) and targeted attacks down to 8.8% from 14.3%. Single Individuals lead the Distribution of Targets chart with 36.3% (it was 19% in November), ahead of healthcare (11%) and Industry (9.9%). Oil and Gas lead the Industry Drill Down Chart. While Non-Profit and Charity lead the Organization Drill Down chart.